Multiple myeloma is a cancer in which antibody-producing plasma cells grow in an uncontrolled and invasive (malignant) manner. Multiple myeloma, also known as plasma cell myeloma, is the second-most common cancer of the blood. 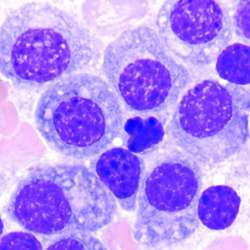 It is the most common type of plasma cell neoplasm. Multiple myeloma accounts for approximately 1% of all cancers and 2% of all deaths from cancer. Multiple myeloma is a disease in which malignant plasma cells spread through the bone marrow and hard outer portions of the large bones of the body. These myeloma cells may form tumors called plasmacytomas. Eventually, multiple soft spots or holes, called osteolytic lesions, form in the bones. Bone marrow is the spongy tissue within the bones. The breastbone, spine, ribs, skull, pelvic bones, and the long bone of the thigh all are particularly rich in marrow. Bone marrow is a very active tissue that is responsible for producing the cells that circulate in the blood. These include the red blood cells that carry oxygen, the white blood cells that develop into immune system cells, and platelets, which cause blood to clot. Plasma cells develop from B-lymphocytes or B-cells, a type of white blood cell. B-cells, like all blood cells, develop from unspecialized stem cells in the bone marrow. Each B-cell carries a specific antibody that recognizes a specific foreign substance called an antigen. Antibodies are large proteins called immunoglobulins (Igs), which recognize and destroy foreign substances and organisms such as bacteria. When a B-cell encounters its antigen, it begins to divide rapidly to form mature plasma cells. These plasma cells are all identical (monoclonal). They produce large amounts of identical antibody that are specific for the antigen. Multiple myeloma begins when the genetic material (DNA) is damaged during the development of a stem cell into a B-cell in the bone marrow. This causes the cell to develop into an abnormal or malignant plasmablast, a developmentally early form of plasma cell. Plasmablasts produce adhesive molecules that allow them to bond to the inside of the bone marrow. A growth factor, called interleukin-6, promotes uncontrolled growth of these myeloma cells in the bone marrow and prevents their natural death. Whereas normal bone marrow contains less than 5% plasma cells, bone marrow of an individual with multiple myeloma contains over 10% plasma cells. In most cases of multiple myeloma, the malignant plasma cells all make an identical Ig. Igs are made up of four protein chains that are bonded together. Two of the chains are light and two are heavy. There are five classes of heavy chains, corresponding to five types of Igs with different immune system functions. The Igs from myeloma cells are nonfunctional and are called paraproteins. All of the paraproteins from any one individual are monoclonal (identical) because the myeloma cells are identical clones of a single plasma cell. Thus, the paraprotein is a monoclonal protein or M-protein. The M-proteins crowd out the functional Igs and other components of the immune system. They also cause functional antibodies, which are produced by normal plasma cells, to rapidly break down. Thus, multiple myeloma depresses the immune system. In about 75% of multiple myeloma cases, the malignant plasma cells also produce monoclonal light chains, or incomplete Igs. These are called Bence-Jones proteins and are secreted in the urine. Approximately 1% of multiple myelomas are called nonsecretors because they do not produce any abnormal Ig. About 70% of individuals with multiple myeloma have soft spots or lesions in their bones. These lesions can vary from quite small to grapefruit-size. In part, these lesions occur because the malignant plasma cells rapidly outgrow the normal bone-forming cells. In addition, malignant myeloma cells produce factors that affect cells called osteoclasts. These are the cells that normally destroy old bone, so that new bone can be produced by cells called osteoblasts. The myeloma cell factors increase both the activation and the growth of osteoclasts. As the osteoclasts multiply and migrate, they destroy healthy bone and create lesions. Osteoporosis, or widespread bone weakness, may develop. There are more than 40,000 multiple myeloma patients in the United States. The American Cancer Society predicts an additional 14,400 new cases in 2001. About 11,200 Americans will die of the disease in 2001. Multiple myeloma is one of the leading causes of cancer deaths among African Americans. In Western industrialized countries, approximately four people in 100,000 develop multiple myeloma. The incidence of multiple myeloma among African Americans is 9.5 per 100,000, about twice that of Caucasians. Asians have a much lower incidence of the disease. In China, for example, the incidence of multiple myeloma is only one in 100,000. The offspring and siblings of individuals with multiple myeloma are at a slightly increased risk for the disease. At diagnosis, the average age of a multiple myeloma patient is 68 to 70. Although the average age at onset is decreasing, most multiple myelomas still occur in people over 40. This cancer is somewhat more prevalent in men than in women. The accumulation of malignant plasma cells can result in tiny cracks or fractures in bones. Malignant plasma cells in the bone marrow can suppress the formation of red and white blood cells and platelets. About 80% of individuals with multiple myeloma are anemic due to low red blood cell formation. Low white blood cell formation results in increased susceptibility to infection, since new, functional antibodies are not produced. In addition, normal circulating antibodies are rapidly destroyed. Low platelet formation can result in poor blood clotting. It is rare, however, that insufficient white blood cell and platelet formations are presenting signs of multiple myeloma. Bone pain, particularly in the backbone, hips, and skull, is often the first symptom of multiple myeloma. As malignant plasma cells increase in the bone marrow, replacing normal marrow, they exert pressure on the bone. As overly-active osteoclasts (large cells responsible for the breakdown of bone) remove bone tissue, the bone becomes soft. Fracture and spinal cord compression may occur. Plasmacytomas (malignant tumors of plasma cells) may weaken bones, causing fractures. Fractured bones or weak or collapsed spinal bones, in turn, may place unusual pressure on nearby nerves, resulting in nerve pain, burning, or numbness and muscle weakness. Proteins produced by myeloma cells also may damage nerves. Hypercalcemia affects about one-third of multiple myeloma patients. Cryoglobulinemia occurs when the protein in the blood forms particles under cold conditions. These particles can block small blood vessels and cause pain and numbness in the toes, fingers, and other extremities during cold weather. Urea and creatinine normally are excreted in the urine. High levels of urea and creatinine in the blood indicate that the kidneys are not functioning properly to eliminate these substances. Protein electrophoresis is a laboratory technique that uses an electrical current to separate the different proteins in the blood and urine on the basis of size and charge. Since all of the multiple myeloma M-proteins in the blood and urine are identical, electrophoresis of blood and urine from a patient with multiple myeloma shows a large M-protein spike, corresponding to the high concentration of monoclonal Ig. Electrophoresis of the urine also can detect Bence-Jones proteins. A bone marrow aspiration utilizes a very thin, long needle to remove a sample of marrow from the hip bone. Alternatively, a bone marrow biopsy with a larger needle removes solid marrow tissue. The marrow is examined under the microscope for plasma cells and tumors. If 10% to 30% of the cells are plasma cells, multiple myeloma is the usual diagnosis. X rays are used to detect osteoporosis, osteolytic lesions, and fractures. Computer-assisted tomography (CAT or CT) scans can detect lesions in both bone and soft tissue. Magnetic resonance imaging (MRI) may give a more detailed image of a certain bone or a region of the body. Monoclonal gammopathy of undetermined significance (MGUS) is a common condition in which a monoclonal Ig is detectable. However, there are no tumors or other symptoms of multiple myeloma. MGUS occurs in about 1% of the general population and in about 3% of those over age 70. Over a period of years, about 16% to 20% of those with MGUS will develop multiple myeloma or a related cancer called malignant lymphoma. Occasionally, only a single plasmacytoma develops, either in the bone marrow (isolated plasmacytoma of the bone) or other tissues or organs (extramedullary plasmacytoma). Some individuals with solitary plasmacytoma may develop multiple myeloma. Approximately 5% of multiple myeloma cases are not progressing at diagnosis, and may not progress for months or years. This is called smoldering myeloma. These patients have stage I blood chemistry but no symptoms. Each stage is subclassified as A or B, based on serum creatinine indicators of normal or abnormal kidney function. Most patients have stage III multiple myeloma at diagnosis. Since multiple myeloma often progresses slowly, and since the treatments can be toxic, the disease may not be treated until M-protein levels in the blood are quite high. In particular, MGUS and smoldering myeloma may be followed closely but not treated. Solitary plasmacytomas are treated with radiation and/or surgery and followed closely with examinations and laboratory tests. Chemotherapy, or treatment with anti-cancer drugs, is used for multiple myeloma. MP, a combination of the drugs melphalan and prednisone, is the standard treatment. Usually, the drugs are taken by mouth every 3 to 4 weeks for 6 to 9 months or longer, until the M-protein levels in the blood stop decreasing. MP usually results in a 50% reduction in M-protein. Dexamethasone, a corticosteroid, sometimes is used to treat the elderly or those in poor health. It can drop the M-protein levels by 40% in untreated individuals and by 20% to 40% in patients who have not responded to previous treatment. Other chemotherapy drugs, including cyclophosphamide, carmustine, doxorubicin, vincristine, and chlorambucil, may be used as well. Multiple myeloma usually recurs within a year after the end of chemotherapy. Although the chemotherapy can be repeated after each recurrence, it is progressively less responsive to treatment. These side effects disappear after treatment is discontinued. Bisphosphonates are drugs that inhibit the activity of osteoclasts. These drugs can slow the progression of bone disease, reduce pain, and help prevent bone fractures. Different types of bisphosphonates inhibit osteoclasts in different ways. They also reduce the production of interleukin-6 by bone marrow cells. Laboratory studies suggest that bisphosphonates may kill or inhibit the growth of multiple myeloma cells. Pamidronate is the most common bisphosphonate for treating multiple myeloma. The drug thalidomide appears to have several anti-myeloma activities. Thalidomide affects the immune system in various ways and it appears to inhibit myeloma cells, both directly and indirectly. It also inhibits the growth of new blood vessels that are needed by tumors. However, if thalidomide is taken during pregnancy, it an cause severe birth defects or death of the fetus. The drug allopurinol may be used to reduce high blood levels of uric acid that result from kidney dysfunction. Diuretics can improve kidney function. Infections require prompt treatment with antibiotics. BONE AND PERIPHERAL BLOOD STEM CELL TRANSPLANTATION. Bone marrow or peripheral blood stem cell transplantations (PBSCT) are used to replace the stem cells of the bone marrow following high-dosage chemotherapy. Chemotherapy destroys the bone marrow stem cells that are necessary to produce new blood cells. In an autologous transplant, the patient's bone marrow stem cells or peripheral blood stem cells (immature bone marrow cells found in the blood) are collected, treated with drugs to kill any myeloma cells, and frozen prior to chemotherapy. Growth factors are used to increase the number of peripheral stem cells prior to collection. A procedure called apheresis is used to collect the peripheral stem cells. Following high-dosage chemotherapy, the stem cells are reinjected into the individual. In an allogeneic transplant, the donor stem cells come from a genetically-related individual such as a sibling. Blood transfusions may be required to treat severe anemia. Plasmapheresis, or plasma exchange transfusion, may be used to thin the blood to treat hyperviscosity syndrome. In this treatment, blood is removed and passed through a machine that separates the plasma, containing the M-protein, from the red and white blood cells and platelets. The blood cells are transfused back into the patient, along with a plasma substitute or donated plasma. Multiple myeloma may be treated with highenergy x rays directed at a specific region of the body. Radiation therapy is used for treating bone pain. Amyloidosis — A complication of multiple myeloma in which amyloid protein accumulates in the kidneys and other organs, tissues, and blood vessels. Anemia — Any condition in which the red blood cell count is below normal. Antibody — Immunoglobulin produced by immune system cells that recognizes and binds to a specific foreign substance (antigen). Antigen — Foreign substance that is recognized by a specific antibody. B-cell (B-lymphocyte) — Type of white blood cell that produces antibodies. Bence-Jones protein — Light chain of an immunoglobulin that is overproduced in multiple myeloma and is excreted in the urine. Beta 2-microglobulin — Protein produced by B-cells; high concentrations in the blood are indicative of multiple myeloma. Cryoglobulinemia — Condition in which protein in the blood forms particles in the cold, blocking blood vessels, leading to pain and numbness of the extremities. Electrophoresis — Use of an electrical field to separate proteins in a mixture (such as blood or urine), on the basis of the size and electrical charge of the proteins. Hemoglobin — Protein in red blood cells that carries oxygen. Hypercalcemia — Abnormally high levels of calcium in the blood. Hyperviscosity — Thick, viscous blood, caused by the accumulation of large proteins, such as immunoglobulins, in the serum. Immunoglobulin (Ig) — Antibody; large protein produced by B-cells that recognizes and binds to a specific antigen. Malignant — A characteristic of cancer cells that grow uncontrollably and invade other tissues. Monoclonal — Identical cells or proteins; cells (clones) derived from a single, genetically-distinct cell, or proteins produced by these cells. Monoclonal gammopathy of undetermined significance (MGUS) — Common condition in which M-protein is present, but there are no tumors or other symptoms of disease. M-protein — Monoclonal or myeloma protein; paraprotein; abnormal antibody found in large amounts in the blood and urine of individuals with multiple myeloma. Neoplasm — Tumor made up of cancer cells. Osteoclast — Cell that absorbs bone. Osteolytic lesion — Soft spot or hole in bone caused by cancer cells. Osteoporosis — Condition in which the bones become weak and porous, due to loss of calcium and destruction of cells. Paraprotein — M-protein; abnormal immunoglobulin produced in multiple myeloma. Plasma cell — Type of white blood cell that produces antibodies; derived from an antigen-specific B-cell. Platelet — Cell that is involved in blood clotting. Stem cell — Undifferentiated cell that retains the ability to develop into any one of numerous cell types. Interferon alpha, an immune-defense protein that is produced by some white blood cells and bone marrow cells, can slow the growth of myeloma cells. It usually is given to patients following chemotherapy, to prolong their remission. However, interferon may have toxic effects in older individuals with multiple myeloma. Once multiple myeloma is in remission, calcium and vitamin D supplements can improve bone density. It is important not to take these supplements when the myeloma is active. Individuals with multiple myeloma must drink large amounts of fluid to counter the effects of hyperviscous blood. The prognosis for individuals with MGUS or solitary plasmacytoma is very good. Most do not develop multiple myeloma. However, approximately 15% of all patients with multiple myeloma die within three months of diagnosis. About 60% respond to treatment and live for an average of two and a half to three years following diagnosis. Approximately 23% of patients die of other illnesses associated with advanced age. The prognosis for a given individual may be based on the prognostic indicators described above. The median survival for those without plasmablasts, and with a low plasma cell labeling index (PCLI) and low beta 2-microglobulin, is 5.5 years. The median survival for patients with plasmablastic multiple myeloma, or with a high PCLI (1% or greater) and high beta 2-microglobulin (4 or higher), is 1.9 and 2.4 years, respectively. Many multiple myeloma patients are missing part or all of chromosome 13. The deletion of this chromosome, along with high beta 2-microglobulin, leads to a poor prognosis. However, with very sensitive testing, a few myeloma cells are usually detectable and eventually lead to a recurrence of the disease, in the bone or elsewhere in the body. There are no clearly-established risk factors for multiple myeloma and it is possible that a combination of factors interact to cause the disease. Thus, there is no method for preventing multiple myeloma. Holland, Jimmie C., and Sheldon Lewis. The Human Side of Cancer: Living with Hope, Coping with Uncertainty. New York: HarperCollins, 2000. Multiple Myeloma Research Foundation. 11 Forest Street, New Canaan, CT 06840. (203) 972-1250. http://www.multiplemyeloma.org. Information and research funding. "About Myeloma." Multiple Myeloma Research Foundation. April 16, 2001. [cited June 15, 2001]. 〈http://www.multiplemyeloma.org/aboutmyeloma.html〉. Complementary and Alternative Therapies for Leukemia, Lymphoma, Hodgkin's Disease and Myeloma. The Leukemia and Lymphoma Society. March 27, 2001. [cited June 15, 2001]. 〈http://www.leukemialymphoma.org〉. Facts and Statistics About Leukemia, Lymphoma, Hodgkin's Disease and Myeloma. The Leukemia and Lymphoma Society. March 15, 2001. [cited Mar27, 2001]. http://www.leukemia-lymphoma.org. "Multiple Myeloma and Other Plasma Cell Neoplasms." CancerNet National Cancer Institute. March 2001. [cited April 16, 2001]. http://cancernet.nci.nih.gov. "Multiple Myeloma." Cancer Resource Center. American Cancer Society. April 16, 2001. [cited June 15, 2001]. 〈http://www3.cancer.org/cancerinfo〉. manifold; occurring in various parts of the body at once. multiple myeloma a malignant neoplasm of plasma cells in which the plasma cells proliferate and invade the bone marrow, causing destruction of the bone and resulting in pathologic fracture and bone pain. It is the most common type of monoclonal gammopathy, characterized by presence of a monoclonal immunoglobulin (immunoglobulin recognized as a single protein), Bence Jones proteins in the urine, anemia, and lowered resistance to infection. Called also plasma cell myeloma. Diagnostic procedures to confirm suspected multiple myeloma include blood analyses, quantitative immunologic assays of serum and urine, urinalysis, bone marrow aspiration and biopsy, and skeletal x-rays. Findings indicative of the disease are an increased number of plasma cells in the bone marrow (usually over 10 per cent of the total), anemia, hypercalcemia due to release of calcium from deteriorating bone tissue, and elevated blood urea nitrogen, Bence Jones protein in the urine, and osteolytic lesions that give the bone a honeycomb appearance on x-ray and lead to vertebral collapse. Treatment. Treatment of multiple myeloma involves chemotherapy and radiation to relieve pain and manage the acute lesions of the spinal column. High-dose chemotherapy followed by blood cell rescue has shown some efficacy in certain situations. Individuals diagnosed with multiple myeloma who show no symptoms do not usually receive treatment. Patient Care. Major problems presented by the patient with multiple myeloma are related to anemia, hypercalcemia, bone pain and pathologic fractures, and emotional distress created by trying to cope with the day-to-day physiologic and emotional aspects associated with the diagnosis of a malignant disease. The more common complications to be avoided are infection, renal failure, and the sequelae of spinal cord compression. Transfusions with packed red blood cells can help alleviate and minimize some of the more severe symptoms of anemia. It is important that the patient be adequately hydrated to improve viscosity of the blood and circulation, to help avoid hypercalcemia, and to maintain kidney function for excretion of the products of protein metabolism. Continued ambulation and moderate exercise help slow down the loss of minerals, especially calcium, from the bones. Other problems are related to the administration of highly toxic antineoplastic drugs. Multiple myeloma. Radiographs of the skull, ribs, and vertebrae show multiple punched out lesions. There is anemia secondary to bone marrow lesions that replace red blood cell precursors. Kidney failure is the most common cause of death. The urine contains Bence Jones protein. From Damjanov, 2000.
multiple organ dysfunction syndrome (multiple organ failure) failure of two or more organ systems in a critically ill patient because of a complex and interrelated series of events. The pathogenesis of multiple organ failure. From Datex Medical Instrumentation, Inc., Tewksbury, MA. multiple personality disorder dissociative identity disorder. multiple-puncture test an intracutaneous test in which the material used (such as tuberculin) is introduced into the skin by pressure of several needles or pointed tines or prongs. This procedure is used in mass screenings, but it is not as accurate as other tests because of lack of precise measurement of the amount of medication actually entering the skin. multiple sclerosis (MS) a chronic neurologic disease in which there are patches of demyelination scattered throughout the white matter of the central nervous system, sometimes extending into the gray matter. The disease primarily affects the myelin and not the nerve cells themselves; any damage to the neurons is secondary to destruction of the myelin covering the axon. The symptoms caused by these lesions are typically weakness, incoordination, paresthesias, speech disturbances, and visual disturbances, particularly diplopia. More specific signs and symptoms depend on the location of the lesions and the severity and destructiveness of the inflammatory and sclerotic processes. The course of the disease is usually prolonged, with remissions and relapses over many years. Brief exacerbations, even with acute and severe symptoms, are thought to be the result of a transient inflammatory depression of neural transmission. Recovery occurs when there has been no permanent damage to the myelin sheath during the attack. Repeated attacks can, however, eventually permanently denude the axons and leave the yellow sclerotic plaques that are characteristic of the disease. Once the disease process reaches the stage of sclerosis the affected axons cannot recover and there is permanent damage. The prevalence of MS is not certain because the disease is not one that is reported, and mild cases can be either misdiagnosed or never brought to the attention of a health care provider. It is far more common in the temperate zones of the world than in tropical and subtropical climates. The onset of symptoms most often occurs between the ages of 20 and 40 years, and the disease affects both sexes about equally. The cause of multiple sclerosis is unknown. It is likely that an inherited immune response is somehow responsible for the production of autoantibodies that attack the myelin sheath. Some authorities believe that infection by one of the slow viruses occurs during childhood and after some years of latency the virus triggers an autoimmune response. Others believe there is an antigen or environmental trigger for the disease. The diagnosis of multiple sclerosis is difficult because of the wide variety of possible clinical manifestations and the resemblance they bear to other neurological disorders. There is no definitive diagnostic test for the condition, but persons with objectively measured abnormalities of the central nervous system, a history of exacerbation and remission of symptoms, and demonstrable delayed blink reflex and evoked visual response are diagnosed as having either possible or probable multiple sclerosis. With time and progressive worsening of symptoms the diagnosis can become definite. Treatment. A multidisciplinary approach is required to diagnose the condition and help patients and their families cope with the attendant problems. Multiple sclerosis has an impact on physical activity and life style, role, and interpersonal relationships; therefore, vocational guidance, counseling, and group therapy are helpful. It is important that the patient with severe disability maintain a positive attitude, focusing on functional abilities rather than disabilities. Regeneration of the damaged neural tissue is not possible but retraining and adaptation are. Stress due to trauma, infection, overexertion, surgery, or emotional upset can aggravate the condition and precipitate a flare-up of symptoms. Supportive measures include a regimen of rest and exercise, a well-balanced diet, avoidance of extremes of heat and cold, avoidance of known sources of infection, and adaptation of a life style that is relatively unstressful while still being as productive as possible. Therapeutic measures include medications to diminish muscle spasticity; measures to overcome urinary retention (such as credé's method or intermittent catheterization); speech therapy; and physical therapy to maintain muscle tone and avoid orthopedic deformities. Management of MS has been greatly enhanced by the availability of interferons beta-1a and beta-1b. Research support is strong that these medications reduce the frequency and severity of relapses. Many multiple sclerosis patients and their families receive valuable support and encouragement from communication with others coping with the condition. A local chapter of the National Multiple Sclerosis Society is within reach of most persons in the United States. Information and assistance in all phases of the disease are available by writing to The National Multiple Sclerosis Society, 733 Third Ave., 6th floor, New York, NY 10017, or consulting their web site at http://www.nmss.org. 1. a tumor composed of plasma cells of the type normally found in the bone marrow. giant cell myeloma giant cell tumor (def. 1). multiple myeloma see multiple myeloma. plasma cell myeloma multiple myeloma. solitary myeloma a variant of multiple myeloma in which there is a single localized tumor focus. Called also plasma cell tumor. an uncommon disease that occurs more frequently in men than in women and is associated with anemia, hemorrhage, recurrent infections, and weakness. Ordinarily, it is regarded as a malignant neoplasm that originates in bone marrow and involves chiefly the skeleton, with clinical features attributable to the sites of involvement and to abnormalities in formation of plasma protein; characterized by numerous diffuse foci or nodular accumulations of abnormal or malignant plasma cells in the marrow of various bones (especially the skull), causing palpable swellings of the bones, and occasionally in extraskeletal sites; radiologically, the bone lesions have a characteristic punched-out appearance. The myeloma cells produce abnormal proteins in the serum and urine; those formed in any one example of multiple myeloma are different from other myeloma proteins, as well as from normal serum proteins, the most frequent abnormalities in the metabolism of protein being: 1) the occurrence of Bence Jones proteinuria, 2) a great increase in monoclonal γ-globulin in the plasma, 3) the occasional formation of cryoglobulin, and 4) a form of primary amyloidosis. The Bence Jones protein is not a derivative of abnormal serum protein, but seems to be formed de novo from amino acid precursors. See also: plasma cell myeloma. A malignant proliferation of plasma cells in bone marrow causing numerous tumors and characterized by the presence of abnormal proteins in the blood. a malignant neoplasm of the bone marrow. The tumor, composed of B-lymphocyte plasma cells, disrupts normal bone marrow functions; destroys osseous tissue, especially in flat bones; and causes pain, fractures, hypercalcemia, and skeletal deformities. The onset is insidious, and most people are asymptomatic until the disease is advanced. In addition, the ability of the plasma cells to make functional antibodies decreases, leaving the person immunocompromised. Characteristically abnormal proteins in the plasma and urine, anemia, weight loss, pulmonary complications secondary to rib fractures, and kidney failure are present. The cause is unknown, but radiation and chemical exposure may increase risk. It occurs in people older than 50 years of age and is twice as common among African-Americans as Caucasians. It occurs equally in men and women. Also called multiple plasmacytoma of bone, myelomatosis, plasma cell myeloma. An uncommon disease that occurs more frequently in men and is associated with anemia, hemorrhage, recurrent infections, and weakness. 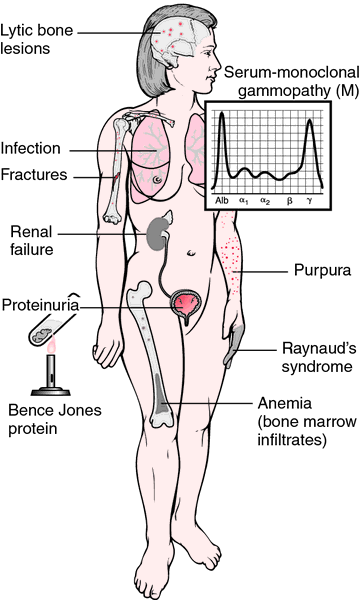 A malignant neoplasm that originates in bone marrow and involves chiefly the skeleton; characterized by numerous diffuse foci or nodular accumulations of abnormal or malignant plasma cells in the marrow of various bones and abnormal proteins in the serum and urine; the most frequent abnormalities in the metabolism of protein are Bence Jones proteinuria, an increase in monoclonal γ-globulin in the plasma, the formation of cryoglobulin, and a form of primary amyloidosis. Synonym(s): plasma cell myeloma (1) . An uncommon disease that occurs more frequently in men associated with anemia, hemorrhage, recurrent infections, and weakness. more than one offspring in a gestation and parturition. a disease in which a combination, or alternative combinations, of causes, are required to produce it. Called also multifactorial etiology. surgical instruments, e.g. heavy duty emasculators, ecraseurs in which each jaw has more than one crushing surface, mounted one behind the other, each successive surface coming into contact with its counterpart as increasing pressure is applied to the handles of the instrument. a method of reproduction in protozoa. See schizogony. simultaneous infection with more than one virus or a combination of virus and bacteria may be caused by one agent lowering resistance to the other. There may be synergism between the agents. the major method of analysis used to sort through a large number of potential risk factors permitting the examination of one factor while the other factors in the regression equation are held mathematically constant. patients with more than one congenital limb defect. in critical care medicine, a state in which intervention is required to maintain homeostasis. Called also MODS. an important feature in the technique of embryo transfer. See superovulation. twins, triplets and more in usually uniparous species. an analytical method which determines the relationship between a dependent variable and one or more independent variables. situations in which more than one risk factor for a disease is present and their combined presence contributes to an increased risk. when a cow accepts more calves to suckle than her own; a system for foster-rearing of orphan or purchased calves. 1. a B lymphocyte tumor. a malignant neoplasm of plasma cells, in which the plasma cells proliferate and invade the bone marrow, causing destruction of the bone and resulting in pathological fracture and bone pain. A secretory form of the disease is characterized by the presence of an immunoglobulin recognized as Bence Jones protein (monoclonal immunoglobulin), Bence Jones proteinuria, anemia, and lowered resistance to infection. It is the most common type of monoclonal gammopathy. A non-secretory form of the disease also occurs. multiple myeloma associated with osteosclerosis (rather than bone destruction) and often with peripheral neuropathy. the immunoglobulin molecules produced by myeloma cells. See gammopathy. Balb/c mice (8-12 weeks of age) were immunized with four intraperitoneal injections of Fc fragments of human IgG 1 or IgG2 myeloma proteins emulsified in Freund's complete adjuvant (Sigma, USA) (first injection) or incomplete adjuvant (Sigma) (other injections) (50 [micro]g every 2 weeks). Specificity of these MAbs was determined, using a panel of purified myeloma proteins, including IgG1 (n=9), IgG2 (n=4), IgG3 (n=7) and IgG4 (n=6) subclasses. In contrast to HP6032 MAb, HP6033 showed also reactivity with IgG3 myeloma proteins having G3m (g) allotype and with one of two IgG3 myeloma proteins having G3m (b) allotype (23). Since three of our MAbs (1F5A8, 6F11E1 and 8F9G7) displayed similar binding activity to SPA with regard to interaction with purified human myeloma proteins of IgG1, 2 and 4 and the IgG3 myeloma protein Goe, as well as human polyclonal IgG1, 2 and 4, but not IgG3 subclasses (Figure 1), the specificity of these MAbs resembled that of SPA. Eight different mixtures of human myeloma proteins from each subclass were prepared in PBS solution with 5 g/L bovine serum albumin and assayed using the same protocol developed for assay of IgG3 (2-h incubation).